A dialogue points to substantial areas of agreement and a call to 'tone down' the rhetoric and focus on cost-effective 'big wins'. Care to try your hand at this? For many Americans, arguing has become a national pastime. Even the sacred ritual of pro football no longer offers temporary respite from the din: It too has devolved into a battleground of partisan refrains lobbed back and forth. Health care suffers the same plight, along with guns, some old monuments and statues, immigration, and tax policy. And of course, those working on climate change are no strangers to the endless, shrill controversy, even around long-understood concepts in physics and chemistry. But does all this energetic debate sometimes lead toward real solutions? Does anyone soften a stance, admit to learning something new, or appreciate a different perspective? Compromise and introspection are vanishingly rare these days. Observing and measuring the dialogue around climate change led to an idea to pull people out of the rut of online arguments, have them sit down together, and engage them in real conversation. Let’s call it a “common ground on climate change” approach that seeks to get past our party-line reflexes, illuminate productive middle ground, and ultimately lead to a path forward. These conversations are not a red team/blue team rehash of the realities of climate change science. Instead, they are an opportunity to slow down, listen to other perspectives, and see if mutual learning might develop. Paul Agle, 36, is a former oilfield geologist turned high school science teacher. He recently relocated from Houston, Texas, to upstate New York. 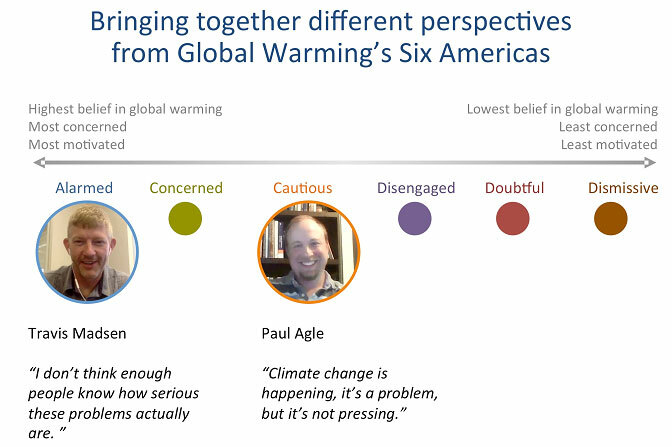 Agle rates himself as “cautious” on the Global Warming’s Six Americas spectrum. He describes the climate debate as overly polarized, with deniers on one end clashing with “true believers.” Agle understands that climate change is a problem, but he doesn’t consider it to be a top priority. Travis Madsen, 40, lives in Denver, Colorado and is a professional climate advocate. He works for the nonprofit Environment America, promoting public policy to reduce pollution and help advance clean energy. Madsen ranks himself as “alarmed” on the Six Americas scale. Agle and Madsen responded to an open query on Facebook seeking people to engage in an hour-long discussion about climate change. Respondents’ views on environmental topics were measured with a screening questionnaire, and people with differing outlooks were matched up for an interview. An attempt was made to pair people who otherwise share age and demographics in common, in part so that they could more easily relate to each other’s outlook. In early August, Agle and Madsen engaged in an online video conversation using Zoom, providing real-time dialog and allowing them and the author of this piece to see and hear each other. Before their interview, Agle and Madsen rated themselves on the Six America’s spectrum. Image adapted by Karin Kirk from Six Americas study. The similarities and differences between Agle and Madsen’s views become clear from their answers to the screening questionnaire: their views about the role of regulation, the impacts of humans on the Earth, trust in scientists, and the risks associated with climate change. The table below shows Agle and Madsen’s responses to the questions. 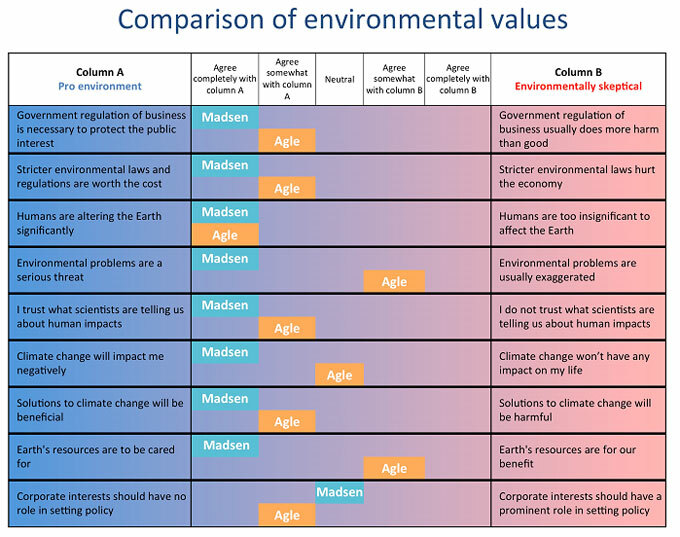 Agle and Madsen rated their own values on environmental themes. Responses that fall toward the left side of the table reflect a strong commitment to environmental issues. Responses toward the right side represent a low priority or lack of trust about environmental issues. Image by Karin Kirk. Agle and Madsen largely overlap in their views that humans are having a significant impact on the Earth, that environmental regulations are worthwhile and necessary, that scientists are trustworthy, and that approaches to managing climate change will be beneficial. On the question of corporate influence in setting government policy, their positions are swapped from the usual partisan viewpoints. Madsen appreciates that while traditional energy companies have an outsized influence in politics, clean energy companies deserve a seat at the table, too. Agle holds a more resolute stance, “Public servants should serve the public, not corporations,” he says. 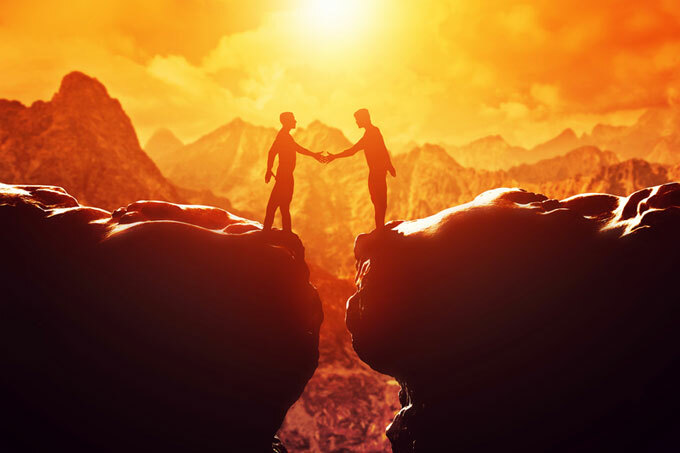 Starting with an appreciation of their shared values helped them resist an adversarial dynamic; it helped establish a baseline of agreement and set the stage for a respectful conversation. Move on to differing views: Are climate risks overstated? The most significant gulf between Agle and Madsen involves their perceptions of the severity of environmental problems. Agle is careful to articulate that he accepts the science of climate change and he respects the scientific literature as the source of credible, trustworthy science. But he doesn’t see climate change as a pressing issue. “There are other priorities we need to address first,” Agle says, noting that food shortages and income inequality rank higher on his list of concerns. Agle also feels that the urgency of climate change is overstated. “A lot of public discussion is focused on the extreme outcomes,” he says, adding that he thinks the media too often tend to blow risks out of proportion. A strong takeaway from the Agle/Madsen conversation was the pronounced middle ground where they agreed with each other. Notably, their conversation centered around the desirability of a rapid adoption of renewable energy. “The faster we do it, the more we can minimize the changes we’re causing – to our planet and to our communities,” he says. Madsen reminds Agle that despite an initial investment in, say, an electric car, it can still have a net positive economic impact over time. Instead, Madsen has found better traction in motivating people who may be only partially on board. He emphasizes “getting those folks to realize that their input and their participation in the political process can be the deciding factor.” Madsen finds that people often don’t realize that their voices do, indeed, have influence. in a common ground interview? We’re looking for people who want to participate in these common ground conversations. We’re particularly interested in hearing from those who are uncertain or doubtful about climate change, or who have recently gone from being skeptical to accepting the science and seeking “solutions.” But we’re open to any perspective. Also, if you have co-workers, friends, or family members who hold a viewpoint distinctly different from your own and you’d like to be interviewed with them, we’d love to hear from you. Send an e-mail to Karin and she’ll send you the “Common Ground on Climate Change” questionnaire.